A set of tangerine orange floral post earrings designed with resin lotus flowers and silver plated posts that come with a set of matching silver tone earring backs. Turquoise Lotus Flower Earrings. Light Teal Lotus Earrings. Silver Post Earrings. Turquoise Earrings. Stud Earrings. Handmade Jewelry. Autumn Orange Mini Mum Earrings. Burnt Orange Earrings. Silver Post Earrings. Orange Flower Earrings. Stud Earrings. Handmade Jewelry. Gray Mini Mum Earrings. Grey Earrings. Silver Post Earrings. Gray Flower Earrings. Stud Earrings. Small Earrings. Handmade Jewelry. 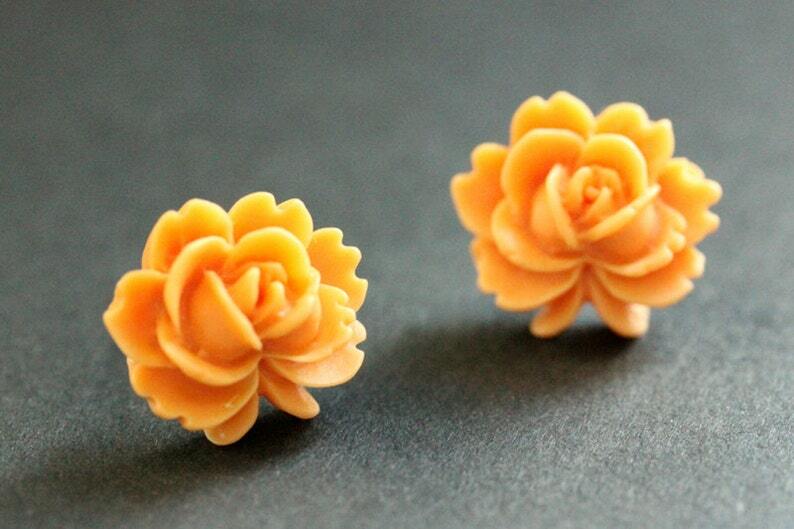 Bright Orange Rose Earrings. Silver Post Earrings. Flower Earrings. Orange Earrings. Handmade Jewelry.